The chemical name for Creatine is methyl guanidine-acetic acid. Creatine is a natural substance found in our muscle cells, especially around the skeletal muscles. It is naturally manufactured in the liver, kidneys and pancreas, and it works as a storage form for potential energy. Widely accepted in the fitness communities across the globe as a top supplement; creatine is used to develop strength and stimulate muscle growth. It is found in muscles, the heart and brain tissue. It is a natural derivative of the amino acids arginine, methionine and glycine. About 95% of the body’s creatine supply is located near the skeletal muscles and the remaining 5% is stored in other parts of the body. Although it comes in many different forms, the most common formula used for athletic purposes is creatine monohydrate. Creatine monohydrate is one of the most well studied supplements in the field of sports nutrition. As a supplement, creatine monohydrate combined with glucose (a simple carbohydrate such as fruit) provides maximum benefits. Creatine is manufactured in the liver using S-adenosyl_methionine as the methyl donor. Creatine may also be derived from dietary sources, primarily from meat or fish, which contain approximately 4 to 5 grams of creatine per kilogram. Following its biosynthesis, creatine is quickly taken to the skeletal muscle, heart, brain and other tissues. Most of the creatine is metabolized in these tissues into phosphocreatine (creatine phosphate), which is a primary energy storage form in the body. Creatine functions to increase the availability of cellular energy ATP, adenosine triphosphate by donating a phosphate ion. When energy demand is high (e.g. during muscle exertion) creatine phosphate donates its phosphate to ADP (adenosine diphosphate) to yield ATP, which drives muscle contraction and protein production. Amazingly, this reaction is reversible: the phosphate of ATP can be transferred back to creatine, generating creatine phosphate by the action of creatine phosphokinase. Phosphocreatine and free creatine is then stored in the muscle for later energy use. When needed, phosphocreatine later binds with ADP to convert it back to ATP. Matched with its popularity in recent years, creatine has been clinically proven in numerous studies to increase muscle strength and delay fatigue, allowing athletes to train harder and achieve greater muscle gains beyond normal capacities. Creatine’s influence on ATP is critical to metabolic activities, especially for activities like weightlifting, sprinting and jumping that are short-term and high intensity . 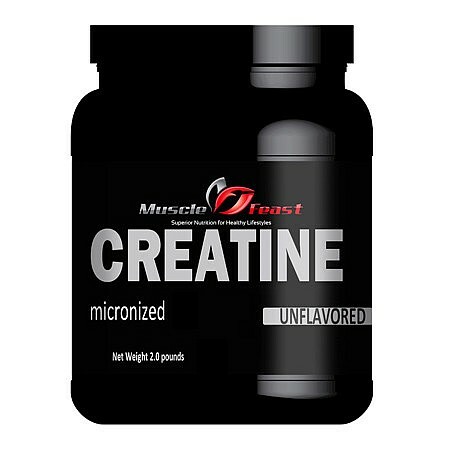 Creatine monohydrate is a dietary supplement that athletes and many bodybuilders use to increase high intensity exercise performance, increase strength, have fuller looking muscles, increase body mass and have faster post workout muscle recovery. Because anything that improves performance is usually associated with steroids, creatine has received a bad reputation in the past from people who do not understand it. There are a wide variety of responses to the supplementatation of creatine; some people respond to it very well and almost instantaneously and others don’t. This is probably attributed to the amount of creatine already in their body. Creatine enables users to continue with their intense and grueling training for longer periods of times. An increase of muscle mass leads to weight gain, which is the result of creatine drawing water into the muscle cell. This is reason enough for many bodybuilders and weight trainers to use creatine alone. Although many professional athletes use creatine, most people will also benefit from the supplementation of creatine monohydrate because it improves strength and fitness in daily activities, can improve mental performance, and has shown to be an excellent antioxidant. Our creatine monohydrate powder is assayed by the manufacturer to be 99.5% pure, according to HPLC standardized testing methods. You will receive a double sealed and labeled bulk polyethylene bag containing this white crystalline powder product. It contains no fillers, taste additives, or anti-caking agents. Studies have shown that creatine monohydrate, when supplemented with proper diet, exercise and adequate hydration, can increase lean muscle mass and strength. Creatine also helps alleviate muscle soreness, thus giving its users a faster recovery time thus allowing them to train more frequently. Creatine is found to be beneficial in the overall growth of the lean muscle mass and provides athletes with enough energy to go on with their strenuous activities. Creatine also prevents the body from relying solely on the process of glycolysis, which has a byproduct of lactic acid. Lactic acid build up can cause a burning sensation in the muscle and if it reaches high levels it can cause muscle movement to cease. Numerous studies have shown creatine monohydrate to be safe for long term use as it does not have any serious side effects. No, studies have shown that consumption of creatine monohydrate causes any serious adverse side effects. However, some people may experience slight stomach and digestive discomfort like gas, bloating or possibly diarrhea for a few weeks when first starting the use of creatine. Digestive and stomach problems may be eradicated by lowering the amount of intake of creatine monohydrate. Since creatine supplementation causes the muscles to retain water, some people may experience a slight weight gain of as many as five pounds in the first few weeks, and may also become dehydrated. If taken in high doses with cimetidine (a medication for heartburn and ulcers), diuretics, probenecid (used for gout), or non-steroidal anti-inflammatory (NSAID) medications (such as ibuprofen), creatine may increase the likelihood of damage to the kidneys. For this reason, it is important to stay within the prescribed doses. People who currently suffer from renal disease should not take creatine. There are two methods of taking creatine monohydrate powder. · The first is called “loading”. This means quickly loading your muscles with creatine. During the first four days, take up to 20-30 grams per day mixed with your choice of juice, energy drink, water or shake. For this method mix, 5-10 grams of creatine in your choice of drink 4-5 times a day for a maximum of 20-30 grams a day. Creatine is best taken with products that increase the amount of insulin in your system. After the loading period, back the creatine amount down to 5-15 grams a day. Make sure you take it every day, preferably after working out. · The second method is a gradual progression in which you skip the loading phase and simply take 5-15 grams per day, each day. Caffeine should not be use while taking creatine. This is because caffeine reduces the effects of the creatine intake due to its nature of being a diuretic. While creatine makes your muscles hold water, caffeine will do the opposite, thereby neutralizing the benefits of creatine intake. Mixing and solubility of Creatine Monohydrate – Creatine is a pure white powder that has no flavor or smell. Creatine monohydrate powder is easily soluble in water, fruit juice or shake. Creatine absorption is improved significantly when taken with something that increases insulin levels. To improve absorption take creatine with any beverage that has a high glycemic index. The consumption of creatine right before or during exercise is not recommended. Creatine absorbs quickly, and because of this it is advisable not to mix creatine powder too far in advance. For those on the go, simply measure the correct amount of powder into an empty water bottle or something similar. When you are ready to take it, fill the water bottle with your preferred method of drink. This information has not been evaluated by the FDA and is not intended to be a substitute for medical advice. ALWAYS consult your doctor or pharmacist. Do not use any dietary supplement as a replacement for conventional care, or as a reason to postpone seeing a doctor about a medical problem. Tell all your health care providers about any complementary and alternative practices you use. Give them a full picture of what you do to manage your health. This will help ensure coordinated and safe care.